Your Bedgrove Liberal Democrats team are fightingto get the parking along Turnfurlong by Aylesbury Grammar School, the High School and the back of the Grange school made safer for everyone, to this end we are putting a petition together to present to the next full session of Buckinghamshire County Council to force the hand of county to put measures in place to mitigate the current free for all. Cllr Chester Jones said “This has been an ongoing issue for many years, the road is not safe for pedestrians or cyclists at the moment, it grinds to a halt when school finishes, and I dread to think what would happen if a fire engine or ambulance needed to get through”, Cllr Alan Sherwell commented “This issue will never be solved, but there are simple measures that County could take to alleviate the current free for all and make the road safer. 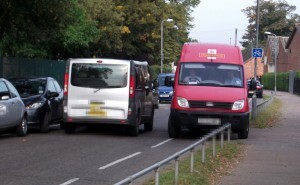 Cllr Mark Willis added “Turnfurlong can be a deadly road, as a cyclist who uses this road to get to work I see the thoughtless behaviour of a minority of motorists making this road dangerous, simple measures, not costing a great deal could be implemented very quickly and easily to end this running problem”. The petition will then be taken along to the next full session of Bucks CC.